For Swazi Trails operated services, cancellations made 21 days or more in advance of arrival, will incur an administration fee of no more than 10% of the value of the amount paid. If cancelled within 14-20 days, 25% of the total price is forfeited, if within 7-13 days, 50% of the total price is forfeited, if within 0-6 days, 100% of the total price is forfeited. If you’re asking yourself “what to do in Swaziland?”, or “things to do in Swaziland?” ……. Well look no further- here’s a quick overview of various activities, attractions and adventures on offer in the Kingdom. Swaziland’s art and crafts are one of their greatest attractions. Well renowned brands such as Swazi Candles, Ngwenya Glass, Gone Rural, Rosecraft, Coral Stephens, Baobab Batik, Tintsaba, Imvelo Eswatini, Eswatini Kitchen, Swazi Secrets, Quazi Design, Golden Hands and Amarasti. (to name a few…..). Of course you can access all these shops by self- drive, taxi or a full day guided tour “Swaziland’s Highlights”. Or if you only have a couple of hours theres a choice between a Northern highlights tour and a Southern highlights tour. Swaziland has the most incredible game reserves, Hlane Royal National Park is Swaziland’s largest conservation area at over 30 000ha. Hlane is home to populations of lion, elephant, leopard, cheetah, rhino, hippo, crocodile, hyena and many other species of wildlife. Accommodation at Hlane varies from camping, bed and breakfast to self catering cottages. Activities at Hlane include game drives and a guided game walk. One can self drive or alternatively take a guided Safari Full day tour to Hlane with Swazi Trails, which includes a game walk and game drive. Mlilwane Wildlife Sanctuary in Ezulwini Valley invites visitors to explore the southern portion of the Sanctuary by foot, vehicle, on horseback and on mountain bikes. You can rent your own mountin bike or go on a guided MTB trail. Mlilwane also has the option of game viewing by horseback- Swazi Trails has a guided adventure tour including a horseback safari. Or, for the not so adventurous Swazi Trails provides a guided Sun downer Game drive in Mlilwane. Accommodation at Mlilwane varies from a traditional experience of sleeping in a bee-hive hut to self catering cottages. Mkhaya is essentially Swaziland’s Refuge for Endangered Species, it is especially famous for its protection of White and Black Rhino. Swazi Trails runs a Full day trip to Mkhaya, including game drives in open Land Rovers, a delicious bush camp lunch. Accommodation at Mkhaya is semi-open stone and thatch cottages that bring you closer to nature- an awesome experience . Swaziland is heaven for an active individual who has a love for the outdoors and nature. We are definitely not short on ideas under this category! Swazi Trails provides a number of thrilling and challenging adventures and activities. 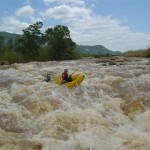 White water rafting on the Great Usutu river is our number one adventure in Swaziland! Options are A full day White water rafting- including lunch, or a Half day rafting option of a quick trip down to the river for rafting session. In the winter months, we offer a White Water Abseiling Tubing Combo. Adventure caving is another highlight, it provides the amateur explorer the unique opportunity of navigating the Gobholo Cave system. You’ll be presented with headlamps, battery packs, muddy passages, bats and lots of total blackness….. Swazi Trails offers two options- Adventure caving during the day and Evening adventure caving option includes a soak in a hot-spring and a yummy pizza after wards. MTB trails is a great way to see Swaziland! Swazi Trails offers a number of trails: Safari MTB Trail in neighboring Mlilwane Wildlife Sanctuary, Cultural MTB Trail in and around Ezulwini Valley- visiting rural areas where everyday Swazi life can be observed, Houses of Parliament, National Museum & traditional singing and dancing. Or…..you could be treated to a full day combing the two- Mountain biking culture and safari combo. Quad-biking is another great way to appreciate Swaziland’s scenery whilst at the same time feeding the adrenaline fed spirit of an adventurer. Swazi Trails offers offers 8km of meandering and interconnecting quad track called “The Devil’s Cauldron Quad Trail” . Swazi Trails offers two guided options of The Devils Cauldron 1hr and The Devils Cauldron 2hr trail. Swaziland’s newest adrenaline adventure is a Canopy Tour that runs in and above the Majolomba River Gorge in Malalotja Nature Reserve. This area for canopy tours was recently rated as one of the best in Southern Africa and the only way to explore this gorge is from the air! Fancy a day on a Houseboat? Maguga Dam houseboat sleeps 4 people and is an awesome opportunity for some quiet time and relaxation. The dam is 100m deep and home to abundant fish, some ‘monster” bass all for catching. The boat is on a self catering basis-well equipped with gas stove, fridge and oven. Other amenities include a hot water shower, TV/ DVD and an on-board fishfinder. Swaziland is rich in culture and Swazi people are very proud of their heritage. This tiny landlocked Kingdom is one of the last monarch states in Africa. There are two main royal ceremonies annually, The Umhlanga Reed Dance and Incwala Ceremony- both celebrating the Swazi culture and its traditions. Swazi Trails offers many guided cultural tours covering all aspects of Swazi traditions and way of life. In short, we have a mild climate here in Swaziland – so don’t stress to much about the weather unless you’re a snowman or a dedicated nudist. Ok – more seriously: we have a warm to hot Southern Hemisphere summer (Nov-Feb) and a cooler winter (June-Aug). Our rain falls in summer, but this isn’t monsoon style rain which last for days… it’s the welcome thundershower type that brings relief at the end of a hot day. Swaziland is also quite varied in temperature and rainfall from the cooler, wetter mountainous areas around Mbabane and Piggs Peak to the warmer and drier lowveld around Big Bend and Simunye. If you’re really paranoid about atmospheric conditions check out these nifty graphs below for a graphic depiction of Swaziland’s average monthy temperatures and rainfall profiles. Skip to the bottom if you’re feet and fahrenheit inclined. White-water rafting, otherwise known as ‘river-rafting’ has been considered Swaziland’s #1 adventure activity for over 20 years. Trips depart on a daily basis throughout the year, with options of Half-day, Full-day and Raft-Abseil-Tube Combo’s available. Swazi Trails is the sole operator of this adventure activity. The same pioneering team responsible for its launch in 1991, is still at the helm to ensure safe and fun excursions. Trips are run in two-man inflatable rafts. Trained river guides accompany all trips. Departures are guaranteed for a low minimum of only 2 persons. Full day rafting-abseiling-tubing combo – 08.30-17.00 daily from June to October. Note: seasons may vary due to changing river conditions from year to year. Seek clarification on trips available at the time of booking. 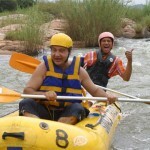 From its launch in 1991, white-water rafting has been rated as the must-do adventure activity in Swaziland. The Great Usutu River is widely regarded as the best white-water to be found south of the legendary Zambesi. 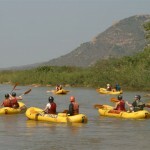 Swazi Trails provide a choice of half or full day guided river trips. This booking tab that you are currently browsing is for Half Day White Water Rafting - available all year round. If you would prefer a full day river adventure, generally November to April then switch to - White Water Rafting Full Day. Another option, for those that are travelling in the winter months, May to October, but who still want a full day of adrenaline and adventure - why not try the rafting, tubing, abseiling combination. The Great Usutu River offers a good range of Grade II to Grade IV white water rapids. Trips are undertaken in two-man, inflatable rafts and guided by local Swazi river guides. Departures are guaranteed for minimum of two persons. Although available all year round, the half day white water option is most popular in the winter months when water levels in the Great Usutu River are lower. During these months Swazi Trails choose to restrict their usual rafting section to only the most enjoyable sections of rapids. Low water does not mean low adrenaline and in fact the section becomes a lot more challenging with more exposed rocks and need for careful navigation. The Great Usutu is Swaziland's largest river. It originates on the South African highveld and flows through central Swaziland and exiting the Kingdom near Big Bend. Then it meanders past Nduma in KwaZulu-Natal and up to the Bay of Maputo in Mozambique. The white-water rafting stretch that Swazi Trails make use of is roughly between the rural villages of Sidvokodvo and Siphofaneni, an area known as the Bulungapoort. The river is wide and at lower water levels it winds its way between numerous islands and sandbanks, which are otherwise covered during the full water season. The location is scenic with tall mountains and forested riverbanks, interspersed occasionally by rural Swazi homesteads. Although the river does change dramatically from full to low water season, there is always enough rapids to maker this day one to remember. Crocodiles are known to exist in the Great Usutu River in various areas, however in the stretch of river used for white-water rafting they do not present sufficient risk to cause alarm. This has been monitored for more than 20 years without incident. The Swazi Trails children's policy varies according to the nature of the activity offered. These trips generally depart only in the morning and run side-by-side with full-day trips. The trip includes approximately 7km of river and some of the most popular rapids (Monica Lewinsky, Station Rapid, The Initiator). After the riverbank lunch the trip returns to Ezulwini. This trip format is available throughout the year. The initial meeting at the Swazi Trails office at Mantenga Craft Centre, Ezulwini allows registration and the signing of waivers and indemnities to be done. Travelling time from the Swazi Trails offices to the river is 45-60min, with transport provided in a closed tour vehicle. All rafting trips start with a thorough safety briefing and a flat-water stretch for practicing technique. Participants paddle and portage their own boats and must be prepared for vigorous activity. After approximately 1 to 1.5 hours of relatively gentle rafting, the action starts at the LUSIP weir and then carries on for the next hour of careful raft-by-raft progression through the carefully guided Holomi Station and Initiator rapid sections. At this point approximately 7 kilometres of river will have been covered and from 2 to 3 hours spent on the river, the variance caused by group size, ability and river conditions. Lunch is a picnic-style affair, served normally near the Holomi Waterfall. The standard menu is a light and tasty: chicken and mayonnaise or ham rolls, together with cheese rolls, fruit, chocolates and orange juice. After lunch rafts are portaged to below the Holomi Falls and the re-launched into the river for a relatively gentle afternoon interupted only by the fast and furious Zambesi Rapid. The take-out point is on the northern bank on a sandy beach, a further 7km after the lunch point. At very high water levels a further 7 kilometres of rafting is often possible which brings rafters past another series of waterfalls and down further sets of rapids. Approximately 1.5 to 2.5 hours is spent on the water in the afternoon. The trip ends with sundowner drinks (beers & soft drinks) and light snacks on the riverbank. The return journey takes approximately one hour. No prior experience is necessary to attempt this river. Participants must be between the ages of 12 and 65, though younger and older persons are accepted by prior arrangement. All equipment is provided, including buoyancy aids ("life jackets") and helmets. Rapids range from grade II - IV, all of which are manageable by absolute beginners after the pre-trip safety briefing. All participants must be of sound health and are required to sign a Waiver & Indemnity Form before departure. Swimming costumes and tie-on or strap-on footwear is required. Strings for sunglasses, broad-rimmed hats and plenty of sun protection cream are recommended. No valuables are to be brought along on trips. Cameras may be taken on river at own risk, provided that the owner has a suitable waterproof casing. The area visited on rafting trips falls marginally within a malarial zone. Precautions are only advised if staying overnight during summer months in the lowveld areas of Mkhaya, Big Bend or Simunye. Those staying in Manzini, Ezulwini or Mbabane need not be concerned as these areas are outside the malarial zone. Swazi Trails is an Operating Member of the African Paddling Association and subscribes to the Codes of Safety and Ethics thereof. River guides are handpicked and experienced in river running, safety and first aid, with affiliation or endorsement from international bodies. Trips are accompanied by a safety kayaker and followed by a support vehicle. Basic medical assistance is within 45 minutes drive from the river. Paramedic assistance is available within 1 to 1.5 hours. At the time of compiling Swazi Trails boasted a 100% safety record over 18 years of operation. Daily capacity is 40 people. For conference or incentive groups special formats can be used for 120 persons or more. Participants are warned that this is an active and participative adventure pursuit and that considerable effort and physical activity is to be expected on and off the river. The capsizing of the raft is an almost certainty in certain areas of the river and participants are well briefed and prepared for this eventuality. River levels vary greatly from season to season, which can alter the level of challenge faced. Participants are advised that crocodiles are known to inhabit rivers in Swaziland, though these are shy and seldom encountered on this stretch. Those with particular concerns are recommended to contact the Swazi Trails office for further information. The Swazi Trails children's policy for the Full Day White Water Rafting trip generally restricts rafting to children of 12 years and above. However in lower water conditions participants as young as 8 years have been allowed to join in. A Special Request should be communicated at the time of booking for all children younger than 12 years of age. Participation is only possible if sufficient small or kiddies-size lifejackets are available. Children under 18 years, accompanied by two adults may enjoy a 50% discount on the full adult rate. Unescorted minors (under 18 years) require the written consent of a parent or guardian. For Swazi Trails White Water Rafting full day trips: cancellations made 21 days or more in advance of arrival, will incur an administration fee of no more than 10% of the value of the amount paid. If a Swazi Trails White Water Rafting full day trip is cancelled within 14-20 days, 25% of the total price is forfeited, if within 7-13 days, 50% of the total price is forfeited, if within 0-6 days, 100% of the total price is forfeited. The full trip departs in the morning from Ezulwini with transport down to the river. There is 14km of river, extended to 21km when conditions allow. The route includes rapids both before and after lunch at the Holomi Falls, with some relaxed and scenic stretches between. This format is available during the summer and autumn seasons only, generally November to May. White-water rafting was introduced to Swaziland way back in 1991 and is rated as the best white-water south of the mighty Zambesi. Swazi Trails offer a half or full day guided trip format. During the winter months of June to October Swazi Trails opt to restrict their rafting section to only the best rapids, which make up a half day trip. However with so many hours of great sunlight (winter is fantastic in Swaziland) why waste the rest of the day? That's how this rafting-abseiling combo came about, with the afternoon jam-packed with exciting ropework alongside the thundering Holomi waterfall. Raft, then abseil, then relax and chill out - in that order ! The Great Usutu River offers a good range of Grade II to Grade IV white water rapids. Trips are undertaken in two-man, inflatable rafts and guided by local Swazi river guides. Departures are guaranteed for minimum of two persons. The abseiling site at Holomi waterfall is particularly scenic with a vast moonscape of granite rocks carved into numerous potholes, twirls and towers of smooth rock. Our abseil is aimed at beginners and is not particularly high, however the staging area is quite exposed and even experienced abseilers will get a little bit of a rush from this gnarly take-off. Abseiling is not offered in the summer months as it can be uncomfortably hot sitting on top of a cliff...when the river is really the place to be. For those that don't have a head for heights and aren't interested in abseiling, we offer another afternoon alternative and that is to re-run the last section of white-water rapids by tube. Swazi Trails provide proper Ark Inflatable white-water tubes, with handle holds and high volume bouyancy, because there's no doubt you'll need it. Note - there is generally not time to do both the tubing and abseiling in one afternoon, so you'll need to choose. This booking tab that you are currently browsing is for a full day White Water Rafting Abseiling Tubing Combo - generally available May to October annually. A quick peek of what sort of action to expect can be taken from the Swaziland Adventures section of our videos page. If you would prefer a half day river rafting trip, available all year round then switch to - White Water Rafting Half Day. If you are planning to be in Swaziland between November and May, you've cracked high water season, so then rather book a full day White Water Rafting trip. All river trips begin with a thorough safety briefing and the opportunity practicing technique on flat water. Rafters paddle and carry their own boats on portages and must be prepared for vigorous activity. After the first 1 to 1.5 hours of fairly gentle rafting, the real challenge starts at the LUSIP weir and then carries on for the next hour thereafter. This section is characterised by careful raft-by-raft progression through the Holomi Station and Initiator rapids in particular. Most importantly, a halt is called just above the Holomi Waterfall. At this point seven kilometres of river will have been covered and this marks the end of the half day stretch. The relaxed riverbank lunch is a picnic-style affair, served near the Holomi Waterfall. The standard fare is a light and tasty chicken and mayonnaise or ham rolls combination, together with cheese rolls, fruit, chocolates and orange juice. After lunch it is time for abseiling or tubing. Abseiling is undertaken during the afternoon on a cliff alongside the Holomi Falls. This involves learning basic rope-work skills and then descending the cliff by means of a figure-8 apparatus. The activity is controlled by a guide, using a safety line. There are also exciting cliff jump and rapp-jumping options for adrenaline junkies. Absolutely no prior experience or skill is necessary to attempt this river. All equipment is provided, including buoyancy aids ("life jackets") and helmets. Rapids range from grade II - IV, all of which are manageable by first-timers after the pre-trip safety briefing. All rafters must be of sound health, although sanity is not a pre-requisite. Swimming gear and tie-on or strapped footwear is best. Ties for sunglasses, hats and plenty of sun protection cream are recommended, even in winter. Valuables are not to be brought along on trips. Cameras may be taken on river at the owner's own risk. A suitable waterproof casing is essential. The rafting area falls marginally within an occasional malaria zone. Precautions are only really advised if staying overnight in the lowveld areas of Big Bend or Simunye during summer months. Those staying in Manzini, Ezulwini or Mbabane need not be concerned as these areas are well outside the malarial zone. Having pioneered rafting fro its earliest days in Southern Africa, Swazi Trails is an Operating Member of the African Paddling Association and subscribes to the organisations Codes of Safety and Ethics. Swazi Trails river guides are hand-picked, extensively trained and well experienced in river running, safety and first aid. River trips are accompanied by a safety kayaker and followed closely by a support vehicle. First stop basic medical assistance is within 45 minutes drive from the river. Paramedic assistance is available with a 1 to 1.5 hours reaction time. Currently Swazi Trails boasts a 100% safety record over 18 years of non-stop river-running. The daily trip capacity is 40 people. For large conference or incentive groups certain special formats can be used to accommodate 120 persons or more. Interested participants are warned that white-water rafting, abseiling and tubing are all active and participative adventure pursuits and that considerable effort and physical activity is to be expected both on and off the river. The capsizing of rafts is almost a given at certain times of the year and participants are well briefed and prepared for this eventuality. River levels do vary significantly from season to season, which can dramatically alter the level of challenge faced. Participants are advised that large crocodiles are known to inhabit most rivers in the Kingdom of Swaziland, though in the area where rafting takes place these are very shy and seldom encountered. Those with particular fears are recommended to contact the Swazi Trails office for further information. The children's policy for the White Water Rafting Combo trips is that rafting and abseiling is generally suitable for children of 12 years and above. However in lower water conditions which are typical of the winter months, participants as young as 8 years have been allowed to join in. A Special Request can be submitted at the time of booking for all children younger than 12 years of age, to which a reply will be given us to whether conditions are suitable for younger participants. Participation is also restricted by the number of small or kiddies-size lifejackets that are available. There is a 50% discount on the full adult rate for children under 18 years, who are accompanied by at least two adults. Any unescorted minors, under the age of 18 years, require the written consent of a parent or guardian, agreeing to their participation and signed the Waiver & Indemnity. For the Swazi Trails White Water Rafting Combo: cancellations made 21 days or more in advance of arrival, will incur an administration fee of no more than 10% of the value of the amount paid. 0-6 days, 100% of the total price is forfeited. The full-day Rafting Combo trip includes the options of abseiling and tubing. This is a winter and spring season format, typically offered from June to October. After the morning’s half day rafting section, participants are offered the choice of either abseiling or tubing in the afternoon. Abseiling is rigged on the cliff just below the Holomi Waterfall, whilst for those not keen of heights the option of returning upstream to re-run some of the main rapids on white-water tubes is an alternative option. There is typically 7km of river rafted, about 1 km tubed and the abseil involves an exposed 20m pitch. 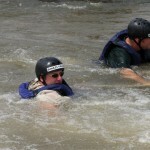 Is white-water rafting safe to do? Let’s not beat about the bush: White-water rafting is a participative adventure activity that does come with inherent risks, full stop. That said, if it wasn’t for those risks there’d be no adrenaline, no challenge, no fun… and you might as well sit at home and watch TV. So what’s the way forward? One, understand these risks, two make an informed decision based on your own ability and tolerance for those risks. -There is a risk of drowning. We mitigate against this risk by providing you with a Personal Flotation Device (PFD)- which is a “life jacket” to all intents and purposes although for some reason the technocrats insist we call them PFD’s. We also give a pre-departure technique and safety briefing, plus have river guides escorting you the whole way down. -There is a risk of bodily injury from muscular strain or impacts. Dislocated shoulders, bumps and bruises, the occasional gash – ouch – but nothing that couldn’t also happen on a slippery bathroom floor. There’s padding in the PFD’s and we insist you wear a helmet whilst on-river. It that fails we have a first aid box along to attempt damage repair. -There is a risk of increased difficulty due to variations in weather and river levels. What we are saying here? Well, in essence our river is not a controlled “park” – it’s the great outdoors, it rains some days, or cooks with heat on others. There is wildlife and even less predictable human life. The river level drops sometimes exposing more rocks, whilst at other times it is full or even flooding with debris and strong currents. Our guides over the years have experienced almost all the variations that nature throws our way. Standard Operating Procedures (SOP’s) have been laid down based on this experience. River guides provide daily leadership on the trips based on these SOP’s and their decisions should be respected. -There is a risk associated with transport to the river. Whilst the corrugated dirt roads and wet-bummed passengers quickly ensure that our transport vehicles look a bit tired and worn, our vehicles are subjected to regular mechanical servicing and are tested bi-annually for road-worthiness in order to maintain their Public Transport Permits. Our drivers are disciplined by strict internal Codes of Conduct and are licensed for public transport. Similar standards are insisted on from sub-contracted transport suppliers. -There are crocodiles and snakes. In this regard we keep an eye out for them, they keep an eye out for us, and both parties definitely prefer to keep their distance. What skills or level of fitness is needed for white-water rafting? No previous experience is needed, nor any special level of fitness. However, this activity is Participative with a capital P. Its not a boat cruise that you can do with a cocktail glass in hand. There isn’t a guide who rows your raft for you whilst you smile and look pretty. A technique briefing is offered at the start of the trip. Thereafter the first few kilometres are gentle and allow for practising those paddling skills. Guides are always close at hand to offer advice… but you must be prepared to propel, steer, recover and portage your own raft. It is however useful to be able to speak and/or understand English. All instruction is given in English and not being able to fully comprehend such communication could put you at risk. Can non-swimmers join rafting trips? We’ve had many weak or non-swimmers on trips over the years. Being a swimmer is not a pre-requisite and we enjoy providing this water-based activity for those who have the confidence to tackle it. Such participants should be aware that there is a high likelihood of them being toppled into the water. Whilst the buoyancy of the PFD (life-jacket) will prevent them from drowning, this experience can still be a bit unnerving. If you’re a non-swimmer and have the liberty of choice, then its better to raft in the winter season – June to October. During these months the river is generally a lot more shallow and in most places you’ll be able to stand if and when tipped in. The bottom line is: if you’re brave enough to try it, you’ll find us brave enough to take you. Where do trips start from? All our trips depart from our office premises in the Ezulwini Valley, which is roughly halfway between Mbabane and Manzini. It is the main tourism area in Swaziland and home to many hotels, lodges and other accommodation facilities. We are situated within the Mantenga Craft & Lifestyle Centre, which is off Mantenga Drive, a suburban loop road just west of the MR103. The location of the Swazi Trails office can be seen on this Ezulwini map. Detailed directions can be printed out from here: Directions to Swazi Trails. 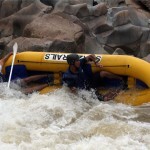 The river rafting section itself is about 45minutes drive away and we provide transport there and back. Although parking at Mantenga Craft is obviously “at own risk”, this is a safe and quiet area with no history of car break-in’s or theft. Parked cars are generally visible from our office windows. Where should we stay overnight if we are planning to go rafting? It makes sense to stay somewhere close to our rafting departure point, although Swaziland being small and travelling distances being relatively short, you could stay almost anywhere. Legends Backpacker Lodge – 1st choice for budget groups or independent travellers, just 100m away. Mantenga Lodge – small private hotel, our offices. Happy Valley Hotel – a new kid on the block. Recently re-built and very glitzy. Then down towards the river there is The Vineyard B&B, where we can arrange to pick-up you up outside Riders Ranch. This option is only suited to half day or Rafting Combo trips. Is it possible to raft if we are only in Swaziland for one night? Yes – it is possible. Generally its best to plan this for your second day, as although you can arrive in Swaziland in time (earliest border post opening is 07h00) it means you’ve got to get going “hellava” early. On day 2, you can raft a Half-Day trip and then head onwards to your next destination with ample time to reach KwaZulu- Natal or Mpumalanga before dark. For travellers heading south through Lavumisa/Golela to Hluhluwe or St Lucia, or alternatively through Mahamba to northern KwaZulu-Natal, we recommend that you follow our rafting vehicle down to the river. Here you can park your car under the watchful eye of a security guard close to our midday lunch-spot. As soon as the half-day or Combo trip is done, you can simply jump in your car and carry on with your journey, rather than having to backtrack back to Ezulwini. This option saves about 2 hours of travelling time. Can I be picked up at my hotel or lodge? Hotel or lodge pick-up’s are not inclusive in the rafting price, however we do accommodate this when and where possible. Generally if your hotel or lodge as en route to the river we can drop-by to pick you up, however an extra charge is levied if we have to send a non-rafting vehicle to pick you up, or if your accommodation is in the opposite direction to where we’re going. In short: if you have your own means of transport, please make your way to our office departure point, all gathering at one point makes the departure much easier. If you are without transport, then let us know and we’ll advise what the options are and what costs are applicable. As a broad guideline we say rafters should be between the ages of 12 to 65 years. However, when conditions are favourable we are happy to take younger or older folk. We’ve had numerous six year old kids enjoy the river and an adrenaline-seeking 74year old, as well. During the lower water winter season generally any age is welcome, but we’re a bit stricter in summer, especially when the river is in flood. For families with multiple kids, we often are able to put one or two into guide boats, to take the pressure off parents. Guides tend not to fall out in rapids and can give the little ones an easier ride. The best thing is to drop us a mail and ask. What should we bring along? Bring the bare minimum! Clothes to get wet in, such as swimming costumes or short pants, a t-shirt, cap or hat and suitable footwear like sandals, takkies, sneakers or slops. Then a towel and clothes to change into afterwards are useful, unless you plan to drip-dry and a jersey/jacket especially in winter. Sun protection cream is a must. Even if you’re dark skinned, wear cream and avoid sun damage. Glasses or sunglasses should be attached with a strap or string. Leave money, passports, wallets etc. behind… unless of course you still need to settle up for your trip. Can we take a camera along? If its waterproof – yes! If you have a waterproof case for it – yes! Otherwise, its not really possible. We do not provide waterproof containers, as these tend only to be as good as the last person to close them. Our standard procedure is for one of our guides to take a camera along and to snap images along the way. These are uploaded to our online Swazi Trails Flickr page for you to download at your convenience. How long in advance should we book our trip? Well, the earlier the better is always good for us, as it helps us to plan staff availability, vehicle usage etc. but the reality is that we can generally process bookings right up until the day before the trip. We guarantee departures for a minimum of 2 persons on a daily basis, except for under special circumstances when we close for operational reasons. You can even try your luck first thing in the morning of the trip, and if you catch us before we seal the catering coolerboxes (just after 08h00) you can jump onto the trip. On what river in Swaziland does the rafting take place? Swazi Trails rafts the Great Usutu River, otherwise known as the Lusutfu River in SiSwati or misspelt as the Usuthu River on occasions. It is the largest river in Swaziland and drains approximately 50% of its surface area. The river has its source in the highveld areas of South Africa near Ermelo. It has 3 major tributaries in Swaziland, namely the Lusushwana (Little Usutu), the Ngwempisi and the Mkhondvo rivers. After it exits Swaziland to the east, it joins with the Pongola River and then becomes known as the Rio Maputo for its final journey into the sea in the Bay of Maputo, Mozambique. Our rafting section is roughly between Sidvokodvo and Siphofaneni in an area known as the Bulungapoort. Most times of the year the river can be considered a grade III, although when it is full it is certainly grade IV, with grade V and VI sections being avoided. Grading a river with just 6 numbers (easiest I to hardest VI) is always tricky due to the many variables involved in river running. The fact that we use 2-man rafts, which are self-propelled without a guide on board, means that even if the river is not as high volume as the Zambezi or the Nile, the day trip can be more challenging for individuals than let’s say floating downstream on a 10-man raft, where the only requirement is to hold-on. Anecdotal evidence and comments regularly rate the Great Usutu as comparable in difficulty to the best rivers in the world. That said: the river is quite forgiving and after 20 years of operation we have managed to get tens of thousands of people safely downstream, a large percentage of them being first-time rafters. The river is certainly more gentle during the lower water season – May to October. Can I come along and watch my family rafting? Yes and no – if there is space in the vehicle, we are happy to charge a nominal to cover lunch and transport, but if space is limited then this is not an option. The trip can be followed in a private vehicle, but please be aware that the road along the riverbank is rough, corrugated and sometimes muddy. There are no toilet facilities and limited shade. There are also only a limited number of places where the rafters can be seen: on departure at the put-in, at the LUSIP weir site and then at the lunch spot and final full-day take-out point. One of the bigger rapids can be reached walking upstream from the lunch spot, but this involves over 300m of scrambling over rocks, not something easy for someone who is not good at walking and scrambling. What are we trying to say? Well – if you’re not a rafter, we’d really recommend you book an alternative trip to keep you occupied or maybe even a health spa treatment instead. We can help you arrange that. Is your white-water rafting considered to be responsible tourism? Well – we’d like to think so, but you can be the judge. we’ve been active protagonists of river and water conservation issues over the past 20 years and have focused attention on water quality issues. These actions have resulted in wider benefits for all water and river users. our business sought out, trained and employed river guides from the impoverished rural community in this area. 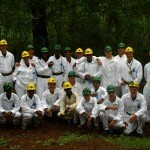 Today we provide permanent employment for these young Swazi men, who have graduated to become Trip Leaders. we set aside a small portion of every single rating payment we receive for community development. Over the years we have focused on assisting the Mphaphati community and specifically the local primary school, where we have been able to build an office block and houses for teachers. Read more about it here and here. Yes – believe it or not, South Africa has much more stringent legislation in the sphere of guide training than almost every state in the USA and many countries in the world. Although such legislation does not apply in Swaziland, we voluntarily align ourselves with those standards through our membership of the African Paddling Association (APA). We make use of APA-endorsed training courses and instructors and our guides undergo both training and training re-assessments on a regular basis. Swazi Trails personnel participate in regular first aid courses and have internal workshops and meetings to improve on operational procedures. Managing Director, Darron Raw, who oversees the rafting operation has been guiding rafting trips since 1989 and is one of the the pioneers of river rafting in Southern Africa. He is also a founder member of APA. In colour – no! The Great Usutu River is definitely a permanent shade of brown, ranging from a subtle hint in the winter months to an almost gritty chocolate after heavy rains. In quality – also no! But we don’t drink it – so this need not be a concern. Exposure to splashes and the occasional spluttered mouthful is unlikely to result in any side effects. Bilharzia is known to occur in almost every east-flowing river in Africa and it is highly likely that it occurs in certain sections of the Usutu. It does not however appear to be prevalent in the section where we raft. This conclusion is drawn from the fact that our river guides, many of whom grew up bathing in its waters, have never shown positive results from bilharzia tests. This parasite is a nasty piece of work though and our advice to anyone who travels in Africa, Asia or South America is to have a test 6 months to a year after returning home, as bilharzia can remain undetected for decades before irrepairable organ damage is detected. Where is the closest medical assistance? There is clinic in Siphofaneni (15-30min away), private hospitals in Manzini and Ezulwini (45-60min away) and a Paramedic Service (Traumalink 911) based in Mbabane (60-80min away). There is no helicopter evacuation service in Swaziland. Our standard operating procedure is to evacuate any injuries using our rafting transport vehicles directly to either MediSun Clinic in Ezulwini or The Clinic in Mbabane. Both are private hospitals. In instances of neck or spinal injury, unconsciousness or cardio-pulmonary resuscitation paramedic assistance is requested. Note: The cost of paramedic evacuation and/or hospital care is for the rafting participants own account. Does Swazi Trails have insurance ? Yes – we have a Public Liability Insurance policy for E 5million and Passenger Liability Insurance to statutory requirement. Please note that this does not remove the necessity for rafting clients to cover themselves with travel and/or medical insurance. Public Liability Insurance comes into play when gross negligence is proven in a court of law. This is likely to be rigorously defended and may take years to be finalised. To cover the costs of immediate and recuperative medical attention, individual personal medical insurance is strongly advised. Insurance can be purchased as an optional extra on our online booking website – buy travel insurance online here. Do you ever stop rafting because of river levels? Yes – we have on occasions cancelled rafting trips when the Usutu River has flooded over its banks. This cancellation may happen at short notice as often the river level can only be gauged on arrival at the put-in point. Guides will take both river conditions and perceived client skills and ability into account when taking such a decision. In this instance full refunds will be offered. We have also cancelled trips when the river gets too low. On some years during winter months we are affected by low water on Sundays and Mondays. This is due to the shut-down of hydro-electric power facilities upstream of us, which impacts on water flow. Such impacts only effect us on 1 out of every 3 years on average. Should malaria precautions be taken? No – malaria precautions are not needed. Firstly, there is almost no risk of mosquito bites during day activities. Secondly, there have been no reported cases of malaria in this area for almost 15 years and thirdly, Swaziland as a whole is on the brink of being declared entirely malaria-free after rigorous efforts appear to have almost entirely removed this scourge from within our borders. 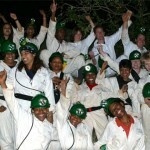 Adventure Caving is another of Swaziland’s top adventure activities. In fact, Swazi Trails, are the originators of the concept of “Adventure Caving” globally, having been the first to coin the phrase back in 1999, when this activity was initially launched in Swaziland’s Gobholo Cave. What is Adventure Caving? This activity fits somewhere between a cave tour, the type you pay an entry fee at the door for and then follow the cement steps onwards, and a speleological club expedition, which is only really accessible to trained and experienced members. Guided Adventure Caving trips make use of specific gear and equipment and requires plenty of physical effort, but it doesn’t require prior experience or special skills. There aren’t any railing, steps, or emergency lighting – this is the REAL thing, its NOT “soft adventure” – this is about as close to the edge as commercial activities can go. Our trips are run twice daily – morning and evening, with variations possible by prior request. Trips take approximately 4-5 hours, whilst our evening departure includes dinner and a swim in a hot natural spring. Adventure Caving is one of Swaziland's most famous adrenaline pursuits. 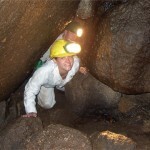 Launched in April 1999, following the exploration of the unique Gobholo Cave system, Swazi Trails now offer amateur explorers the opportunity to get underground in true speleological fashion. Headlamps, battery packs, muddy passages, bats and lots of total blackness are all part of the experience - ideal for first-timers, as well as dedicated spelunking experts. The caves were formed by an ancient boulder choke which has been further opened and eroded into subterranean chambers by the passage of water through softer rock material. This is the only known major cave system in granite rock in Southern Africa and thus presents a unique geological experience. The system can be compared to a giant underground gravel pit, with cavers manoeuvring themselves like ants through the myriad of gaps and passageways. Care has to be maintained to stick to the known routes, as portions of the cave remain unexplored. A minor river flows through the bottom of the cave, which can only be reached by athletic and competent groups. The cave location is scenic with tall mountains and surrounding forested areas. Participants are required to register at the Swazi Trails office 30 min in advance of departure (08h30) to fit helmets, uniforms and cap lamps. Trips start with a 15 min journey in a closed vehicle to a point approximately 2 km (30-45 minute walk) from the cave. The cave is situated on private property. On arrival at the cave entrance a safety briefing is given and the trip heads underground for approximately 2 hours in total. The deepest distance travelled is 90 m below the surface and the total distance travelled underground is about 800m. Progress underground is slow and methodical with teamwork required in a number of places. Belly crawls, body jams, crouches and rope-assisted scrambles are to be expected. On returning to the surface, snacks (chocolates and peanuts) and refreshments are enjoyed before tackling the half-hour walk back. Snacks and refreshments are all inclusive. A massage with access to the indoor spa bath and sauna can be booked for after the adventure caving at a nearby hot spring. This is an additional charge - but great value for a 45 minute full body massage. Return time is approximately 13h00. However, this is dependent on group travelling speed. No prior experience is necessary to attempt this Swaziland caving adventure. All equipment is provided, including full-length overalls, helmets, sealed lead-gel cap lamps and safety gear. Trips are run by competent adventure guides who offer a thorough safety and technique briefing. All participants are required to sign a Waiver and Indemnity Form before departure. Participants must be between the ages of 8 and 65 years. Minors (under 18 years) require the written consent of a parent or guardian. All participants must be of sound health. Obese persons are not encouraged to participate. A strong pair of leather boots is ideal, but running shoes are also useable, as long as the sole has good traction. Slops or sandals are unsuitable. 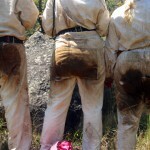 Shorts and T-shirt are advised for wearing under the caving overalls (supplied by Swazi Trails). A swimming costume and towel should be brought by those wishing to enjoy the hot spring swim on the return journey. No valuables are to be brought along on trips. This area falls outside of malarial zones and precautions are not necessary. Participants are warned that this is an active and participative adventure pursuit and that considerable effort and physical activity is to be expected. Caves are inherently dangerous places to visit with possible exposure to unprotected pits, slippery surfaces, loose boulders and the danger of dislodged stones. Like all high-risk sports these risks can be minimized, so as to make Adventure Caving a challenging, but enjoyable experience. Participants should also be aware of the fact that caves are known to house histoplasmosis, a fever-causing fungus that infects the lungs and causes flu-type symptoms. This is treatable and is similar to tick-bite fever. Persons with low resistance to infection, such as caused by HIV are warned of this risk. To date there have been no confirmed reports of infection from participants on these Swazi Trails-led excursions. All guides are handpicked and competent in safety measures and first aid. Full medical assistance is found within 20 minutes drive of the vehicle. If children under the age of 18 years are accompanied by two paying adults, they will be charged 50% of the tour or adventure activity rate. These trips depart predominantly in the morning, however afternoon departures can be accommodated by advance arrangement. The Gobholo Cave, which is the site of this activity is situated at the top end of the Ezulwini Valley close to Mbabane. The trip includes approximately 1.5 – 2hrs of hiking, and 1.5 – 2hrs of caving depending on pace. After arriving at the cave a safety and technique briefing is offered and thereafter participants are led by the guide through a circular route covering approximately 800m with approximately 200m of vertical ascent/descent. This adventure activity is available 365 days a year, with trips only cancelled during heavy rainfall. Adventure Caving is one of Swaziland's famous adrenaline pursuits. 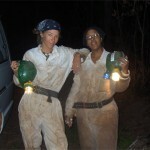 Launched in April 1999, following the exploration of the unique Gobholo Cave system, Swazi Trails now offers amateur explorers the opportunity to get underground in true speleological fashion. Headlamps, battery packs, muddy passages, bats and lots of total blackness are all part of the experience - ideal for first-timers, as well as experts. The caves were formed by an ancient boulder choke which has been further opened and eroded into subterranean chambers by the passage of water through softer rock material. This is the only known major cave system in granite rock in Southern Africa and thus presents a unique geological experience. The system can be compared to a giant underground gravel pit with cavers manoeuvring themselves like ants through the myriad of gaps and passageways. Care has to be maintained to stick to the known routes as portions of the cave remain unexplored. A minor river flows through the bottom of the cave, which can only be reached by athletic and competent groups. The cave location is scenic with tall mountains and surrounding forested areas. Participants are required to meet at the Swazi Trails office at 16h30 to fit helmets, uniforms and cap lamps. Trips start with a 15 minute journey in a closed vehicle to a point approximately 2 km (30-45 minute walk) from the cave. The cave is situated on private property. On arrival at the cave entrance a safety briefing is given and the trip heads underground for approximately 2 hr in total. The deepest distance travelled is 90 m below the surface and the total distance travelled underground is about 800 m. Progress underground is slow and methodical with teamwork required in a number of places. Belly crawls, body jams, crouches and rope-assisted scrambles are to be expected. On returning to the surface, snacks (chocolates and peanuts) and refreshments are enjoyed before tackling the half-hour walk back. Evening departures include an informal dinner (steaming hot pizzas) afterwards and a soothing dip in a nearby hot spring. Entry fees, snacks, the meal and refreshments are all included. Return time is approximately 21h30. However, if the hot spring waters are too difficult to leave, then a later return can be arranged. The soothing warm waters are yours to enjoy. All participants are required to sign a waiver and indemnity form before departure. Participants must be between the ages of 8 and 65 years old. Minors (under 18 years old) require the written consent of a parent or guardian. All participants must be of sound health. Obese persons are not encouraged to participate. A strong pair of leather boots is ideal, but running shoes are also useable, as long as the sole has good traction. Slops or sandals are unsuitable. Shorts and a T-shirt are advised for wearing under the caving overalls (supplied by Swazi Trails). A swimming costume and towel should be brought by those wishing to enjoy the hot spring swim on the return journey. No valuables are to be brought along on trips. This area falls outside of malaria zones and precautions are not necessary. All guides are handpicked and competent in safety measures and first aid. Full medical assistance is found within 20 minutes drive. Children under the age of 18 years old pay 50% of the adult price provided they are accompanied by two full-paying adults. - Cancellations made 21 days or more in advance of arrival will incur an administration fee of no more than 10% of the value of the amount paid. - If cancelled within 14-20 days, 25% of the total price is forfeited. - If cancellation takes place within 7-13 days, 50% of the total price is forfeited. - If cancelled within 0-6 days, 100% of the total price is forfeited. The evening trip is generally the more popular of the two options, as it allows time for sightseeing during the day, before maximising the use of often limited time, by being a great way to fill the evening. Our destination, the Gobholo Cave Complex is found at the head of the Ezulwini Valley, just south of Mbabane. The full trip includes approximately 1.5 – 2 of hiking, and 1.5 – 2hrs of caving and an hour or two in the hotspring (its hard to get out!) On arrival at the cave entrance a detailed safety and technique briefing is provided. Participants are then guided through a circular route of approximately 800m with +/- 200m of ascent and descent. A feature of this trip, almost as famous as the cave, is the social soak in Ezulwini’s famous ‘Cuddle Puddle” hot spring, together with steaming hot pizza and cold beer. This caving adventure is bookable throughout the year. Departures are only cancelled during heavy rainfall. Is Adventure Caving safe to do? Let’s put it this way: going deep-deep underground, clambering over boulders, squeezing through narrow gaps, skirting unprotected 20m drop-off’s, crawling cross slippery surfaces, avoiding loose rocks and relying on others for foot and hand-ups is not your everyday walk in the park. Caves are inherently dangerous places and also why this is called “Adventure” Caving, proper Adventure with a capital A! However, the way that we run trips helps to mitigate against the risks and “thunk” (we just touched wood) we haven’t had any major (or even minor) injuries in the cave since we launched this activity in 1999. We had a German who fell head first down a 10m “worm-hole” once, but he luckily emerged in the 4th dimension with nothing less than a bruised ego, and a portly doctor once broke his ankle just before he entered the cave. The German is now immortalised forever in the naming of the feature “The German Hole” and we won’t forget the doctor either, because carrying him down the mountain on a stretcher was probably the most physically taxing thing we’ve ever had to do. So the long and short of it is… we’re going to try and avoid damaging you, as best possible, please work with us. What skill levels or level of fitness is required to do Adventure Caving? No special skills are required, you need to be well-balanced on your feet, but that is about all. The walk to the cave is 2km and then 2km back, including a few steep sections. This tends to sort the smokers out from the non-smokers. In the cave itself there is lots of unusual body movement and contortion, so most participants emerge feeling like they’ve had a solid gym work-out – but that’s about it. You may be stiff the next day, but its that kinda nice stiff feeling… the kind that says you really achieved something. What is the biggest group that can go caving at any one time ? We have enough lights for 20 persons at any one time, which is effectively 10 persons per guide. However, systems have been successfully used in the past to accommodate larger groups. For some team-building and school groups we have adopted a “buddy system” whereby two individuals share one light and look after each other. On other occasions when time has allowed we have run split departures with 20 persons every 2 hours, handing over lights at the entrance to the cave. Note: in this latter instance we sometimes run short of sufficient overalls to cloth all participants, so the wearing of old clothes is advised. On some days we get caught in light rain during the walk. Most of the time during summer months the caving is dripping and moist, such that we end up a little soggy at the end, but this is not cave diving and we do not swim in the cave. If I am claustrophic should I participate? Nope, no, not advisable! Can we book a canopy tour for you? Scared of height too… bummer! How about you skip the caving and head straight to the hot spring. Good? SOLD! If I am a little overweight, can I go caving ? Yes – a little bit overweight is fine, obese is out. Yes, sorry its not fair we know! Half of all Americans and most well-heeled Africans are ruled out here, but the architect who designed these caves was a bit restrictive on passage space between caverns. Obesity is useful if you fall overboard in the Antarctic ocean, or if you are morooned on a desert island for 3 weeks, but we haven’t found any use for it when caving. More seriously, we do have some alternative routes we can take for the slightly more well-padded of you, so we won’t abandon you like Pooh Bear in Rabbit’ s burrow window. But you get the hint? That said: we did successfully guide a 180kg Sumo wrestler through once, who had a good power to weight ratio, but… Ok you’ve got the picture, good… next question. These trips depart from the Swazi Trails main office in Swaziland’s Ezulwini Valley. This is situated halfway between Mbabane and Manzini cities. Ezulwini is the main tourism area in Swaziland, so its right close to where its all happening. There are plenty of hotels, lodges and other accommodation facilities nearby. More specifically we can be found at the Mantenga Craft & Lifestyle Centre - just off Mantenga Drive, which branches off the MR103 road. The exact location of the Swazi Trails office can be read off on this Ezulwini map. Printable directions can be downloaded from here: Directions to Swazi Trails. The caves are 15min from here and we provide transport. Parking at Mantenga Craft is at own risk, but this is a safe and quiet area with no history of car break-in’s or theft. Parked cars are generally visible from our office windows and during evening there is a security guard present. Is it possible to go caving if we are only staying one day in Swaziland ? The evening caving trip is the ideal activity to do if you a pressed for time, largely because it makes use of otherwise wasted time in the wasted. Wasted that is, unless you are a punter who couldn’t afford to miss valuable casino time. Lets be honest, Swaziland’s not a place you generally go for night life – so Adventure Caving is where it happens! So use daylight for keeping out the usual attractions: game parks, craft markets, historical sites and cultural villages, then hit the “unusual” in the evening! Does Swazi Trails do lodge or hotel pick-ups ? Pick-up’s from hotels or lodge are generally not inclusive in the caving price, however we do accommodate this when and where possible. Certainly if you get a taxi to drop you off, we can then normally arrange to drop you back at your place of accommodation again afterwards, especially if its late at night. If you have your own transport, please make your way to our departure point. If not, let us know in advance and we’ll advise what the options are and what costs are applicable. Our guideline is 8 to 65yrs, but we’ve had a few 6yr olds before and a 70yr old, so age is but a number. This is physically demanding for older people, so be aware of that. For kids the walk is big one, whilst the cave itself is like a giant jungle gym and not so much of an obstacle. Please note that our overall sizes go down to about 13-14yr size only, so younger kids should come with their own old clothes. What should we bring along ? Sense of humour is a good start. Correct shoes are essential. You need a decent hiking boot or sports shoe with nice tread underneath. Shoes with a smooth sole are suicidal, flip-flops or slops are a joke. We provide an overall as an outer layer to protect body and clothes. It is still a good idea to wear old clothes underneath. Shorts, gym tights and t-shirts are ideal. Lihheya, dresses, sari’s, burqahs or kilts for that matter, are all not appropriate. For those doing the evening trip: a swimming costume, towel and a warm top for afterwards will best for enjoying the hot spring. Going naked in the pool, however nice your body might be, is not allowed. If you’re staying in a larney hotel and not travelling with your own towel, remember to nick one from the pool deck when they’re not watching. Other valuables should be left in your car or hotel room. You do not need your passport, flight tickets, credit cards, travellers cheques or wads of cash with you… erh, ok wads of cash for a guide tip is acceptable. You laugh… but people keep arriving with this stuff. Picture Indiana Jones – bullwhip, fedora hat, buggered leather jacket, sweaty, badly in need of a bath… he never needed any of that day-to-day travel clutter… and nor do you when you go Adventure Caving. Yes – but entirely at your own risk. No, sorry we meant ENTIRELY AT YOUR OWN RISK. The cave trip is quite abrasive, often soggy, muddy and gritty too. Then again, there are plenty of camera manufacturers these days that claim their cameras are up for this type of abuse… so your decision. What is advisable is a padded pouch to protect it… and if not small enough for a pocket, that there is a belt or strap to carry it It is essential that your hands are free, because you’ll need all three of them. Trips are available to run twice daily, BUT if there aren’t pre-booked trips we often give our guides off-days and/or other trips to run, so if you pitch up at 16h25 and want to go caving at 16h30 you may be out of luck. The best is to book at least the day before… and ideally as early as you can. We also have an after hours mobile number +268 76020261 which is held by one of our Reservations staff. This can be used to maker bookings after hours. Can we book online for Adventure Caving? Yebo… yes – Swazi Trails is a pretty “with-it” kind of company, even if we hang-out in a relative global backwater. You can book and pay in advance very easily – just follow these links below. Payment is possibly via credit card (Mastercard and VISA), PayPal and by Electronic Funds Transfer (EFT) for South African and Swazi account holders. Can I come along and watch my friends or family caving? We do have the occasional non-caver who comes along for the walk, but who doesn’t enter the cave. This you can do, but in all honestly its not much fun. Its a REALLY remote place in the mountains, with thick bush and forests. During the day its a pleasant enough place to hang-out and sun bathe, but at night its a long and lonely two hour wait – no benches, no chairs, no lights… you get the scenario. Ask us for alternative options. Is Adventure Caving “responsible tourism”? We’ve ensured that the cave remains pristine inside, we’re careful not to disturb cave creatures, we’ve assisted academics with the study of bats, we’ve had experienced members of the South African Speleological Association assist us with policies and procedures, we provide job opportunities for local Swazi guides, we use a bare minimum of fossil-fuel driven transport, the water in the hot spring is naturally heated… you tell us if we’re sustainable in our approach or not… and if you have some bright ideas how we can do it better, we’re keen to listen. Are your guides trained ? We use local Swazi guides from nearby communities. Having first aid training is a pre-requisite and our training involves on-the-job experience and mentoring. Our guides generally do at least 15 to 20 trips as an assistant guide before they are ready to lead groups themselves. From time-to-time the company does informal “refresher courses” to talk through scenarios and ensure adherence to our Standard Operating Procedures). There is no certification system available to us in Swaziland. Are there any risks of disease? Participants should also be aware of the fact that caves are known to house a fever-causing fungus that infects the lungs and causes flu-type symptoms. The infection is called histoplasmosis. This is treatable and is similar to tick-bite fever. Persons with low resistance to infection, such as caused by HIV are specifically warned of this risk. To date there have been no confirmed reports of infection from participants on these excursions, despite the visible presence of fungus at certain times of the year. Some expert opinion has indicated that only 1 in 100 000 people who are exposed to the fungus, actually become infected. We’re well short of having so many people grace us with their presence at the Gobholo Caves… so our opinion is… be aware, but relax! MediSun Clinic and Mbabane Clinic are both 10-15min away by car. This are private hospitals with trauma staff on permanent call. Paramedic assistance can be called. That said, evacuation from the caves would be a time-consuming exercise and may require a significant amount of time. Our first aid kit on site can be used for minor injuries. For injuries requiring evacuation our procedure would be to get a paramedic vehicle within 45min walk of the cave. 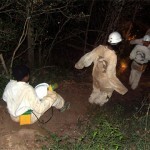 Thereafter, paramedics would walk to the cave and stabilise the injured party. If deep within the cave a large rescue team would be assembled to assist with man-handling a rescue stretcher to the surface. This could take anything from 4 hours to a whole day depending on where the injury takes place and how severe it is. We kid you not, its not surprising that “cave rescues” make front page news – they tend to be dramatic exercises! Moral of the story – listen to the guide, have respect for the remoteness of your environment, don’t be gung-ho and tread carefully. Are caving trips ever cancelled? Yes – if it pours with rain in the catchment area of the Gobholo River our Standard Operating Procedure is to cancel the trip. This is not necessary in light rain or drizzle. If Swazi Trails cancels the trip, full refunds will be made. If you cancel at the last moment due to light drizzle, then our standard cancellation terms apply. No – there never has been malaria recorded anywhere close to this area… and we don’t care if your doctor in Oak Hill Alabama says that his map shows the whole of Swaziland greyed out. We live here, take our word for it! Swazi offers two quad bike trail options in Swaziland. Both are situated in the central Ezulwini Valley area, close to most major hotels and lodges. Our quad trail was purpose-designed purely for quad-biking and has been described as one of the most interesting all terrain vehicle or ATV tracks in Southern Africa. Known as the Devil’s Cauldron, the area was once an active tin mine in the early 1900′s, which is now totally re-forested and inhabited by a variety of bird and wildlife species. All that remains of the mine workings are deep gulley’s, or as they are known locally dongas, which make for a challenging environment for quad-biking. There is hardly 20m of straight track, with twits, turns and corners being the order of the day. This is not a high-speed trail and most rides engage only 2nd and 3rd gear. Swazi Trails provide undoubtedly the best quality quad bike for commercial operations, the Suzuki Ozark LTF250. This powerful bike, with a semi-automatic clutch system is ideal for beginners, but also fun for more experienced quad riders. We have an age limit of 16 years and above. Lifting or riding two-up on a quad bike is also considered unsafe and not permitted on this trail. The Devil's Cauldron Quad Trail offers 8km of meandering and interconnecting quad track. Every metre was cut and purpose-built to maximize enjoyment and skill development. The venue is immediately adjacent to the Royal Swazi Sun hotel complex in a site that was intensively mined for tin some 75 years ago. The resulting deep donga's (gulley's) and scarred landscape has been reclaimed by nature over time and is now fully re-vegetated with grass, riverine forest and reed beds. There is a stream bubbling through and the area is teeming with birdlife, flowers & small mammals, including duiker & nyala. A large central "canyon" with high red earth walls is what has given rise to the venue label as "The Devil's Cauldron". Opened in December 2006, after 8 months of extensive scoping and development the Devil's Cauldron Quad Trail offers 8km of quad track, suitable for total beginners as well as experienced ATV (all terrain vehicle) enthusiasts. Trails are fully guided on 250cc Suzuki "Ozark" quads with one and two hour options available from 08h00 to 17h00 daily. Special requests can be made for earlier and later departures to fit busy touring, conference or golfing schedules. Trips depart for a minimum of 1 person and a maximum of 8. For pre-booked corporate groups, capacity can be boosted to 21 bikes per hour, split between 3 lead guides. The quad trail can be linked up to exciting team-building exercises and/or multi-activity fun sessions including paintball, archery & orienteering, which are also available through Swazi Trails. Need some visuals of what the tree looks like: take a peek of what to expect on the Swaziland Adventures section of our videos page. After completing check-in procedures; registration, signing of waiver and reviewing of the quad trail rules, participants are fitted with helmets (sizes S to XL). Disposable sanitary caps provided. A thorough briefing is given on quad operating skills. Beginners are given a few minutes to practice riding the quads in the flat parking lot area. Once everyone is confident to go, the group falls in behind the trail guide. Standard procedure is to start with an easy loop, which gives participants a chance to get used to the feel of the quad. As soon as the guide assesses that participants are ready for the next level, they are led onwards through a progression of loops and routes with increasing challenges. At each new challenge the guide stops, carefully explains the necessary technique, then stands-by closely as each rider passes by. Only expert quad riders are led onto the really challenging sections of the trail. Due to the nature of the trail, most riding is done in 2nd and 3rd gear. This is not a high-speed track. The trail finishes back at its starting point at the Royal Swazi Sun Hotel. The Suzuki 250cc Ozark is a semi-automatic quad. There is no clutch, however participants need to change gear manually using a toe-click pedal. The quads have an automatic start, front and back handle bar brakes and an additional foot brake. There are 5 forward gears and 1 backward. These are powerful, but stable ATV's and are rated as the best available design for commercial trail riding. Bottled water on ice is carried by the guide, and a refreshment break is taken approximately half-way through the trail. No prior experience is necessary to attempt this activity. Participants are however required to have a reasonable grasp of English so as to understand operational and safety instructions. The manufacturer's specifications indicate that 250cc quads are suitable only for persons 16 years or older. All participants are required to sign a waiver and indemnity and minors require the signature of a parent or guardian. Participants must be fully sober and anyone arriving with a drink in hand or suspected of having been drinking will be politely asked to re-schedule for a later slot. Equipment provided, includes an open-face helmet with visor. Participants are required to wear closed shoes, not slops, sandals nor high heels! Sun cream is recommended on hot day. A swimming costume should be included for those wishing to take a swim after the trail. No valuables are to be brought along on trips. Participants in this Swazi adventure activity are warned that this is an active and participative pursuit and that considerable effort and physical activity is to be expected. Any self-propelled vehicle brings with it certain inherent risks of driver error. Like all high-risk sports these risks can be minimized, through listening carefully to the pre-departure briefing and to all the guide's instructions. There is little chance of injury for those that ride conservatively and within their skill range. The Devil's Cauldron Quad Trail includes tight corners, unprotected drop-off's into donga's, overhead tree trunks, steep inclines and descent and numerous trees and stumps alongside the track. These are easily negotiated if maintaining an appropriate speed. In order to control reckless riding and quad abuse participants are requested to indicate whether they are beginners or experienced riders on arrival. Beginners will be very carefully led for the first hour, with speed strictly controlled and route choice limited to relatively flat areas. 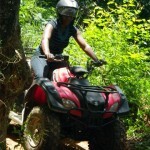 During this time the guide is responsible for supervision and any damage to the quad bike is covered by Swazi Trails. Beginners who rapidly gain confidence and ability have the option of upgrading to a more advanced level of trail after the first hour is complete. Experienced riders, or graduated beginners are expected to ride responsibly and to exercise care in not damaging the quad bikes. Any damage caused by poor quad handling or reckless riding will be charged for in full. All Swazi Trails quad guides are handpicked and competent in safety measures and first aid. A private hospital is found within 10 minutes drive of the track and paramedic evacuation is available within 30 minutes with Traumalink 911. Please note that trips are subject to cancellation at short notice during periods of heavy rain. Full refund or optional alternative activities offered in this event. This area in Swaziland falls well outside of malarial zones and precautions are not necessary. Children under the age of 16 are not permitted to participate in this activity due to the manufacturer's specifications on the 250cc Suzuki Quads that Swazi Trails use. The adult rate for quad rides applies to all participants. Note: With Swazi Trails quad trails the above standard cancellation policy is largely waived. Refunds are happily given to individual travellers whose plans change, even it the last moment. Experience this amazing Swaziland Canopy Tour at Malolotja Nature Reserve. Available on a daily basis, this 3-4 hour adventure activity is suitable for both young and old. This canopy tour is an opportunity to combine adrenaline with appreciation of the natural environment. Zipping between platforms near the tops of trees and criss-crossing a gorge from cliff-face to cliff-face, is an experience that cannot be achieved in any way other than on a canopy tour. Known otherwise as zip lines, cable-ways, tree top tours or cable tours, a canopy tour involves using a harness system to attach yourself to a tightly stretched cable that links numerous wooden platforms. Under the careful guidance of canopy tour guides you guide effortlessly from platform to platform. The entire procedure is very well controlled and at no time are you exposed to any danger or unnecessary risk. Participants are clipped into safety lines at all times, and although braking (to reduce speed) is done manually by the individual, back-up safety systems are in place to slow down those who may need assistance. Mlilwane Wildlife Sanctuary – main rest camp and beehive villages. This Swaziland safari offered by Swazi Trails, is an ideal way to explore Hlane Royal National Park, home to populations of lion, elephant, leopard, cheetah, rhino, hippo, crocodile, hyena and many other species of wildlife. 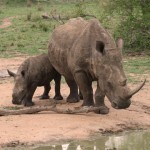 The Hlane Game Parks is Swaziland's largest conservation area at over 30 000ha. Hlane is held in trust for the Swazi Nation by His Majesty King Mswati III. A network of game-viewing roads criss-cross the game reserve's flat terrain, weaving between 1,000-year old hardwood vegetation and past shallow pans which attract great herds of animals during the dry winter months. Swazi Trails have been running day tours to Hlane Royal National Park since 1987 and are well acquainted with the best ways to get value out of this high-quality game-viewing sanctuary. Hlane Royal National Park is approximately one hour from Ezulwini/Mbabane. During the transfer your driver will point out many interesting features as the tour crosses Swaziland from west to east. On arrival at Hlane our recommended itinerary kicks off with a 2.5 hour guided walk to see game up close on foot. This is undertaken under the guidance of a Hlane park ranger. A variety of antelope can be seen. Lunch is enjoyed at the camps restuarant overlooking the water hole and is included. This full day of game-viewing concludes with an open vehicle tour of the lion and cheetah introductory areas, where again regular close game-viewing and photographic opportunities exist. This tour lasts for approximately 2.5 hours and is undertaken with a game-drive vehicle supplied by the park. Thereafter Swazi Trails provide a return transfer to Ezulwini, with optional drop-offs in Manzini, Malkerns or Mbabane. Tick repellent and sun protection cream is advisable, with good walking shoes highly recommended. Swazi Trails use air-conditioned Toyota Quantum vehicles for the transfer to Hlane. An 8 - 10 seater open safari vehicle is used for game viewing within the reserve. Protective netting is provided on the sides of this vehicle. Park might be inaccessible on some occasions due to heavy rain. Full refund will be given in this event. The policy at Hlane Royal National Park is that children under the age of 13 years may not participate in the guided walks for safety reasons. Similarly children under the age of 6 years are not permitted on open vehicle game drives. For families whose younger members are unable to participate in all game-viewing activities, Swazi Trails are happy to entertain these children in the Ndlovu Camp area from where all trips depart. The camp in fact has some very interesting interpretive trails, displays and wildlife activities and is ideal for this purpose. Swazi Trails pricing policy sees children under the age of 13 years paying 50% of the adult price, provided that they are accompanied by two full-paying adults. Almost guaranteed viewing of a wide variety of big game - black and white rhino, elephant, buffalo, hippo, giraffe, zebra, wildebeest, jackal, tsessebe, waterbuck, roan and sable antelope, as well as many other species. Viewing is undertaken in open Landrovers at surprisingly close proximity, with guiding by friendly Swazi rangers. On occasions visitors are led on short bush walks for more intimate viewing of big game. Even ardent fans of the Kruger National Park will be awe-struck at the quality of this national wildlife attraction. A delicious bush camp lunch of venison meats, salads, phutu and home-made bread is enjoyed in the shade of tall riverine trees at the reserve's tented camp. Note: his tour is inclusive of a chauffeured transfer service from hotels and lodges in the Mbabane-Ezulwini-Manzini area to Mkhaya. Travelling time approx. 1-1.5 hrs each way. Tick repellent and sun protection advisable. Raincoat/water proof jacket in summer months if possible (otherwise park supplies free waterproof poncho). Early reservation required, especially for large groups. Children under the age of 13 years pay 50% of the adult price if accompanie by two full-paying adults. No children under the age of 4 years allowed at Mkhaya. Cancellations made 21 days or more in advance of arrival, will incur an administration fee of no more than 10% of the value of the amount paid. If cancelled within 14-20 days, 25% of the total price is forfeited, if within 7-13 days, 50% of the total price is forfeited, if within 0-6 days, 100% of the total price is forfeited.